I’ll admit it… I am a Southwest Airlines loyalist – it’s the only airline I fly unless there is simply no other option. Been that way for years. I was on my way home from Baltimore last week and as we’re boarding, I kept hearing one of the flight attendants repeat an announcement about the best way to place the larger carry-on bags in the overhead bin. 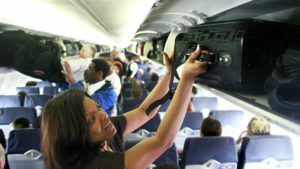 Carry-ons are continually an issue. There are always a few folks whose luggage won’t fit or the overheads are just full… so they have to get back out of the plane and check their bag at the jetway… slowing things down. The flight attendant’s instructions were to put the bags in wheels first – and guess what? Every single bag fit! Here’s why… Southwest added an extension to the overhead space (4-6 inches, I’m guessing), but it made a world of difference. It allowed all bags to go in wheels first (not sideways), making extra room for more bags in each bin. Brilliant… simple… and not inexpensive. When I asked the flight attendant about the change, she said that was indeed what they did. Then added, “but I’m not sure why we did it… we’ll be getting rid of this plane pretty soon.” Think about that… Southwest took the time and money to fix a relatively small irritant to improve the CX, even knowing – in the case of some of their planes – that it would be for the short term. I love these guys! On the other hand… We’re all aware of the widespread phone outages that took place last week… with AT&T and others. These problems impacted millions of people and businesses across the US. We were one of those businesses. Yup… a 27-word text message. That’s it. No real explanation. No plans for making sure it doesn’t happen again. No refund for down time… or special offers to make up for it. Southwest spends millions in plane upgrades to address a relatively small CX issue… while AT&T sends out a friggin’ text message in response to a problem that has a serious impact on its customers. Is it any wonder why Southwest is always listed near the top of most-admired companies (#7 in 2015 in Fortune)… while AT&T, uhh, isn’t? My point of these two stories is this… your client’s opinion of their experience with your firm isn’t just about the work you do for them. It’s often about all of the little things you do during the course of your relationship that are the basis for their perception of you. Things like… are you prompt at returning emails… do you share your cell # so you’re easy to get hold of… is your billing timely… do you provide regular updates during a project… do you take ownership of problems… do you make an effort to really get to know your clients… are your reports easy to follow… and so on… and so on… and so on. Let me suggest that you sit with your team and begin to detail out all of the touch points of the CX for your clients – the big ones and the small ones. Then put in place a plan to make sure each of those is buttoned-up. A memorable CX not only creates satisfied clients… more importantly, it fosters loyal ones.